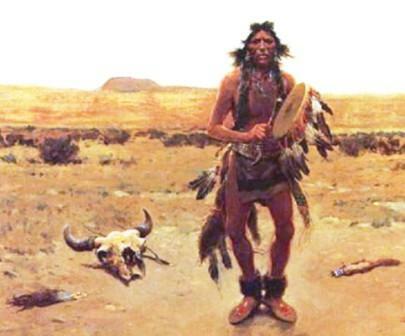 Facts and history about the life and lifestyles of Native American Indians. American Indian drums are percussion instruments, often made from a hollowed out log. The wooden drums were covered with a soft hide, stretched tight over the top and around the framework that was strung with sinew. There were many different types and sizes of American Indian drums including hand drums that rested on the arm and large drums that were set on the ground. Other types included the water drum used by Woodland Indians and a foot drum used by Southwestern Indians including the Pueblo and the Hopi. Designs included double sided and single sided instruments. The American Indian drum was beaten with a hard stick, called a beater. The life, history and lifestyle of Native American Indians is a varied and fascinating subject. The following fact sheet contains interesting facts and information on American Indian Drums. For additional facts refer to Native Indian Flutes and American Indian Music. American Indian Drums Fact 11: The types and style of drums were numerous. The single-sided hand drums were commonly used by the Great Plains and Woodland tribes and were an important part of the regalia of the Medicine men.